The Snooze Button Generation 2019: Who's playing Time Out for Trivia? The problem with sports is sports culture. I don't mind watching an NFL game every so often, or following the lies Tiger Woods says about his domestic woes, but I can't stand sports culture and sports bars. Good God, man. I guess I shouldn't be so judgmental, but a lot of dudes at sports bars seem lacking in sophistication and verbal skills. I feel the same way about most sports talk radio and sports TV, so I stay away from that stuff. 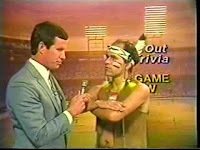 Back in the mid-80s, though, one sports show stood above them all in terms of sophistication, artistry and humor: "Time Out for Trivia." "Time Out for Trivia" aired on the obscure SCORE network, which was around for a mere six years. Strangely, it was a subsidiary of the almost as obscure Financial News Network. Hosted by Todd Donoho, a Southern California sportscaster who I've met, the show blended humor, sports trivia and lame giveaways. 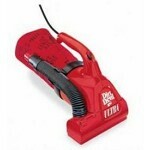 In fact, one of its popular prizes was the miniature Dirt Devil vacuum cleaner, which was easy to use and did the job of the big boys. So often, television is about economics. Shows are put together with the audience thought about first, and artistry second. In the end, those shows stink. "Time Out for Trivia" was similar to art for art's sake, and that's how I prefer game shows. Too frequently, the prizes are the focus of game shows. The quiz master's performance is more important than those pesky prizes, and Donoho was superb. Strangely, when I met him and told him this, he thought I was being insincere and making fun of it. But I was serious. Ribs, the official dinner of Time Out For Trivia! Thanks for the compliments on Time Out For Trivia! I developed and produced TOFT, one of the true highlights of my career in sports television. Todd was wonderful to work with, we did over 1,000 live shows together and there is nothing like live TV. One of the best decisions we made was adding a laugh track. I usually HATE canned laughter on TV show, but I implemented it because SCTV - one of my favorite all-time shows with John Candy, Eugene Levy, Rick Moranis, Joe Flaherty, etc. - used it brilliantly, and I thought it would work well on our show, and it did. Another major reason the show worked was because of our crew, the best group of people you could ever work with. We gave everyone the freedom to create and put their personality into each show, from the director, TD, stage managers and the guys in audio. They helped us so much, and we received tremendous reviews all over the country, including one in the Sports Illustrated Swimsuit issue, which led to Todd and I landing jobs at KABC-TV. We had a great run at Channel 7, had great times, was very proud of our work there, made lifelong friend, but nothing was as much fun as Time Out For Trivia on FNN/SCORE. I was addicted to this show when I was 9 years old. I tried to call in several times but never got through. One time, my father played a prank on me by picking up another phone in the house and pretending to be a TOFT call screener. I spent about 5 minutes doing an interview and providing all this information in hopes and excitement that I would finally get on the air and maybe even win that parquet flooring for my mom. Then I realized I was just talking to my dad. I cried. caller!!" Where can I get my hands on some of those most memorable moments?. Great show; I remember it well. My fav parts were when Todd would do an informal "countdown" when awaiting a response, with his fingers; 5-4-3-2-1. Or on occasion, when someone would win the "grand" prize, they'd play the theme from the Lone Ranger. Bizarre, but funny and very entertaining. Eric: don't know if you remember me or not, I visited the studio and was the official TOFT leprechaun, wearing a hat on St. Patty's Day...and I was a pre-game guest because I wrote a letter stating my love for Diana Koricke. Just dug out my Sony DVD R burner and am in the process of burning my approximately 9 VHS tapes filled with TOFT shows recorded back in the day. Hope I can get in touch with you at some point. Eric, I use to be one of the stage managers on TOFT. I remember you were quite a hard working and talented producer. Todd was always on point as host. I enjoyed those crazy days at FNN. I was there from 1981-1991.